Advertising networks are an important part of most publishers' business plans, but what impact do they have on performance? 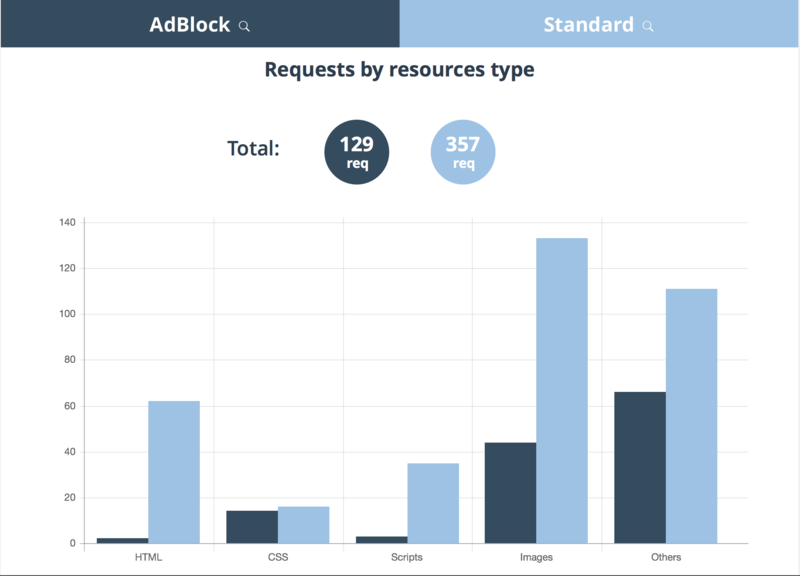 Using Dareboost, we tested two client sites using two different ad networks to see the resource usage. In both tests, we compared the site's homepage at 60mb/s (equivalent to a fiber connection) and standard desktop sizes. The only difference was that we turned on Dareboost's ad blocking tools. We'll keep the sites anonymous, but they are both sites that have had speed issues over the last few years, with themes that don't follow good performance practices, so we're expecting them to be slow and erratic. I'll also note that Dareboost's Ad Blocker seems less effective than Ad Block Pro (which I use in my browser) as it still returned some results that should have been blocked. All of those resources were pretty small though, weighing in at 0.67MB for Network A and 0.375MB for Network B. Then again, we host some sites with homepages that weigh in on the higher side of that scale. Both sites load over http/2, which should nullify some of the impact of multiple resources if the resources are loaded from the same source. Sadly, there's a lot of sites in the ad network that are not sending resources over http/2. 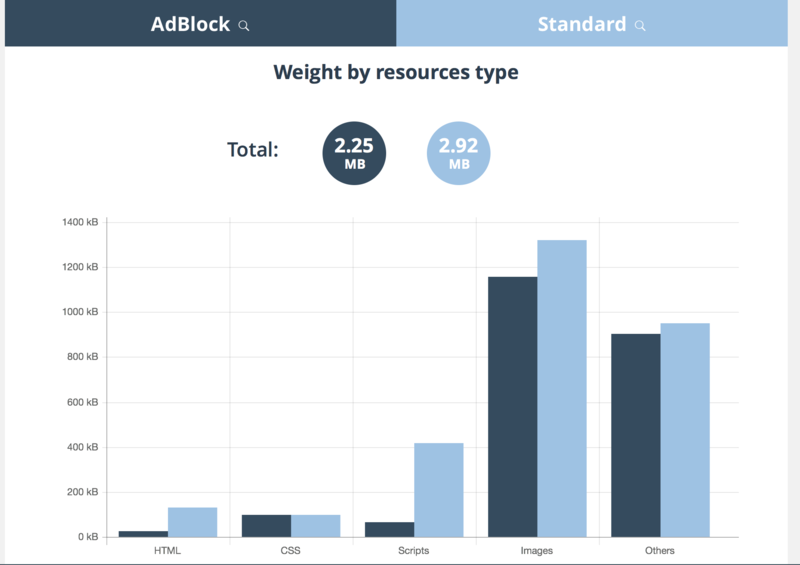 Sadly, less than half the site resources could take advantage of the faster load times available. Results were similar on both networks. 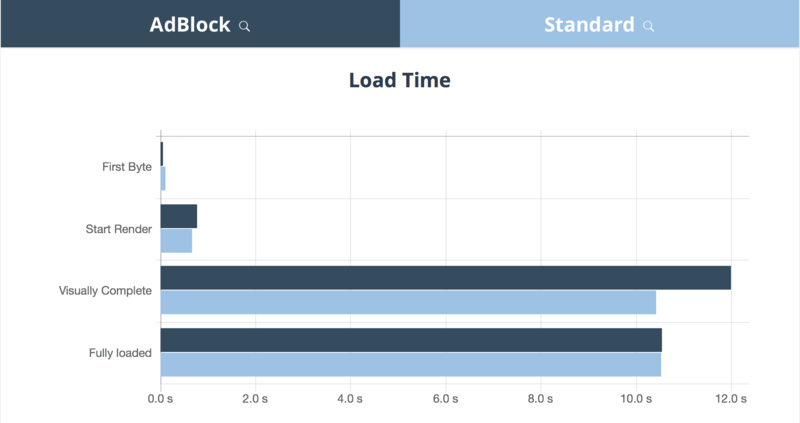 Speed in server response time was lightning fast on both sites with and without the ads, showing Performance Foundry's CDN, caching and hosting stack are well suited for loading WordPress quickly. We like to see "start render" times around 0.3s, but as noted for the Network A site, this is a theme we know is problematic. Without adblock, the above-the-fold rendering time was as much as half as slow again. Adblocked is on the left, standard is on the right. The ad-blocked time is still outside of Google's recommended time, but we're a mile away with ads on. 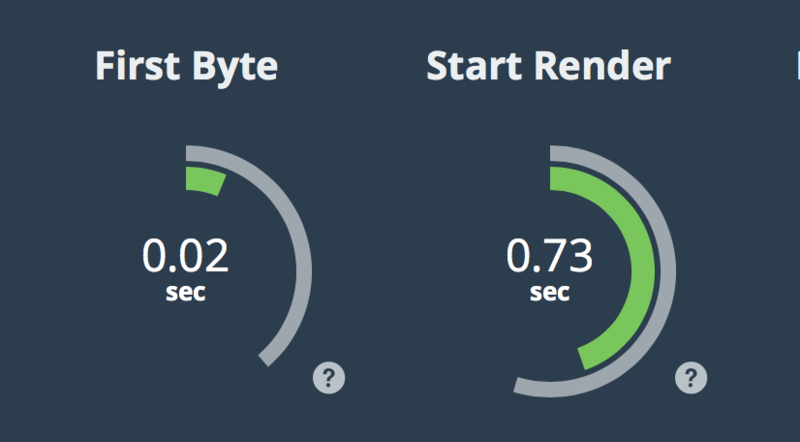 In both cases we see a significant difference in rendering time. Above the fold is definitely slower; what about the whole page? We can see no noticeable difference in the fully loaded time for ad-blocked or standard pages. We have reached out to Dareboost to understand more about their rendering engine and the impact they believe we're seeing in this test. Below is my best guess on the results, with no time to dig further. This site returns results that I'd think are more typical, with the site being visually complete in much less time without ads. A significantly different experience for the end user! This test demonstrated just two loads of the same two sets of pages. We have no control over what ads were loaded, nor -- since these are live sites -- can we compare the different ad networks under identical, real-life conditions.. These results may not be typical. We can see that ad networks can have a big impact on load time, and the technical aspects that are needed to score well in SEO can be negatively impacted. However, a publisher lives on their revenue and ad networks are needed. When starting a new campaign or implementing a new advertising partner, be sure to benchmark before and after implementation, and add an annotation to your Google Analytics so that you can compare traffic sources and user behaviour before and after the roll-out. If you'd like to have your site performance benchmarked, be sure to pick up a WordPress Speed Report from Performance Foundry or switch to our Managed WordPress Hosting to get a speed report included for free. How large should the images I upload be?